There's cultists in them hills. It took me a while to decide how I felt about Far Cry 5. I can’t tell you how many times I flipped back and forth on scores and talking points during my time with it, but what I can tell you is that, moment to moment, it’s a fun game. It really is. But it’s also a game that Ubisoft didn’t seem to trust to stand on its own feet. You can tell that some very talented people worked on Hope County, and they nearly broke through the barrier from “very good” to “great”. What really holds the game back, though, seems to stem from an unwillingness to run risks on a big-budget project. 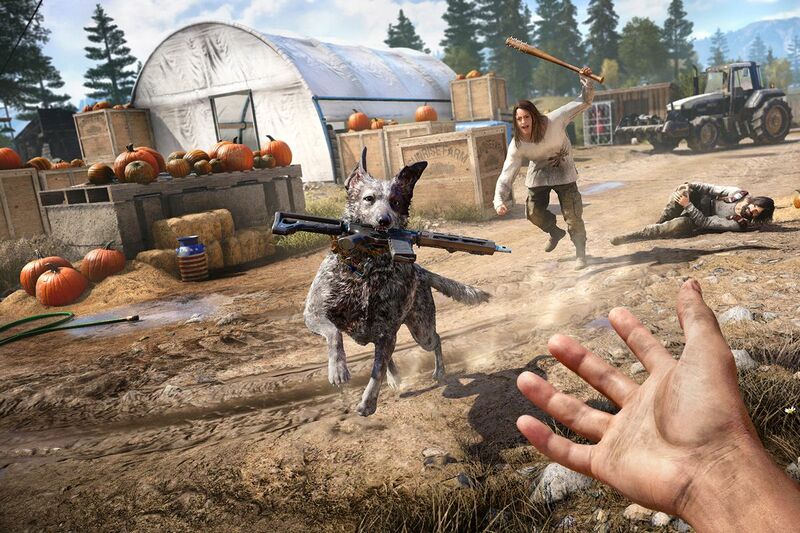 The same things that make Far Cry 5 so grand in both scope and detail also serve as its anchor, making sure it never strays too far from the path. Over the last few years of covering games for Co-optimus, I’ve learned that one of the key differences between a solid experience and a bar-raising landmark only fully reveals itself after the credits roll. It comes when you’re talking with a friend over drinks and, when the game comes up, the two of you spend half an hour recounting shared memories. It comes when you’re sitting at the bus stop and, apropos of nothing, you’re reminded of a vista, puzzle, or boss battle. One of Far Cry 5’s attempts at delivering such an experience is a mechanic Ubisoft calls “The Anecdote Factory”. In theory, this means that the game is generating unique scenarios that result in pure, chaotic sandbox goodness. My experience, however, was more akin to drowning in a never-ending sea of armed cultists. It turns out that Far Cry 5 interpreted “factory” a bit too literally. More often than not, the anecdotes are, “I killed so many cultists at once that even I started to feel bad for Eden’s Gate”. This in and of itself isn’t a horrendous offense, but it can quickly delve into frustration once the cult gains any real awareness of your existence. In standard sandbox game fashion, a number of passable-to-enjoyable side objectives can be happened upon as you explore the countryside, but at higher levels of “Resistance” (Far Cry 5’s abstraction of your regional notoriety), I often found myself harassed out of doing them for any significant period of time by the cult’s foot soldiers or air force. On the surface, this constant flow of threats aligns with Ubisoft’s hope for the aforementioned wackiness, but the more I encountered it, the more I realized that the game never quite seems comfortable with giving you a moment to yourself. Instead of allowing the world to breathe and gradually immerse you, the developers overload you with limitless, shallow interactions, as though in fear of a hint of boredom. It’s a shame, because Hope County is absolutely gorgeous. Were you granted a meaningful amount of peace and quiet, you could really come to appreciate the amount of detail that’s gone into every nook and cranny of the environment. The land itself genuinely feels like a once-peaceful region, with the stark contrast between serene countryside and retrofitted barracks serving as a constant reminder of the cult's occupation. One solid point in the game’s favor is its take on revealing objectives. 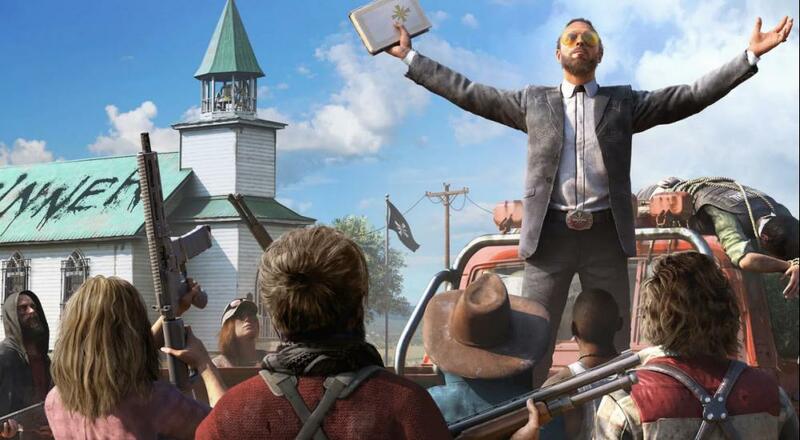 Whereas previous Ubisoft sandbox titles have employed the notorious tower-climbing sequence (or something similar) to reveal a region’s side content, Far Cry 5 takes a far more organic approach. As you wander, you’ll come across civilians, resistance members, and various signposts that will each reveal an individual marker on your map. It’s a very clever mechanic that legitimately serves to immerse you into the world and gives you another reason to not simply Fast Travel from mission to mission. Through aesthetics and organic interaction, the environment tells its own story, and it’s often leagues better than the story that the game actually wants you to remember.